Your heart is pounding. All eyes are on you, though you can’t tell because the spotlight is blinding. You have been preparing for this moment for weeks, and it is finally here: your final dance performance. During this moment, most students feel a combination of excitement, anxiety, relief, and and happiness. But if you aren’t properly prepared, your nerves might drown out the rest of the positive feelings you are experiencing. One way to ensure that you get to enjoy the fun and excitement of a dance performance is to be properly prepared. In this blog, we will go over the best ways for you to make sure your show goes off without a hitch. The saying goes that “practice makes perfect,” but no one is perfect, nor should they strive to be. If you’re aiming for perfection, you will inevitably be disappointed. However, this doesn’t mean practice is fruitless. The more you practice, the more ingrained your performance will be in your mind. If you have your routine down to a tee, you will feel much more confident about your abilities because your body will just go into autopilot due to muscle memory. 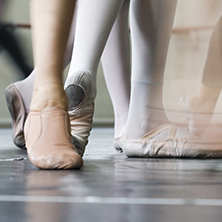 When it comes to dance, persistence is so much more important than perfection, so practice, practice, practice is the first step to preparing for a performance. Don’t put off making sure you have all of the costumes you need for your dance performance. The last thing you want to do is be running around the day of your show, trying to find everything you need for it. Save yourself the anxiety and make certain you have everything you need well in advance so that you don’t end up in a panic before your performance. This ensures you are able to be fully present and prepare emotionally to perform. The last thing you need before a performance is a poor night’s sleep. Being tired will make it harder to be coordinated and will make it more difficult to focus. When you go to bed the night before, if you’re feeling nervous, make a point to picture your performance going swimmingly. Go through every moment of your performance in your head, and picture it going well. This will help create a positive image of yourself in your head, and will help ease your mind enough to sleep. The day of your performance, it’s imperative that your body has the energy it needs to move. Performances are often even more draining than rehearsals because not only are you dancing up a storm, you are also using a lot of mental energy. Make sure to eat healthy, whole foods that give you energy with a healthy balance of protein, carbs, and fat. A good breakfast the day of your performance would be a spinach omelette with a side of buttered wheat toast and a glass of orange juice. If you are stressing out about your performance, focusing on everything that could go wrong, you’ll never be able to see what you’re doing right. Your mind is a powerful tool. If you decide that your performance will go well, then it will. If you decide that you are going to fail, you will. The difference is the attitude with which you approach it. Keep in mind that as long as you have done everything you can to get your routine down, all that stands in the way of you and an amazing performance is your own frame of mind. At Star Bound Dance Company, we offer dance lessons in Alberta to ensure that children as young as two can learn the amazing art of dance. If you are interested in enrolling, contact us today to register at our dance studio!